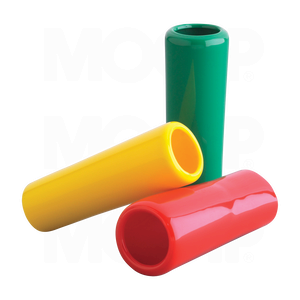 MOCAP Vinyl Plastic Hose Collar Guards are flexible but tough reinforcement bend restrictors designed for water, hydraulic and pressure washer hoses. These tough bend restrictors prevent damage to consumer and industrial hoses extending the life of the hose. Easy to install hose bend restrictors feature a tapered design that simplifies installation and provides a secure fit. The inside lip of the hose bend restrictor attaches to the coupling, locking the restrictor in place. Collar Guard Bend Restrictors can be imprinted and customized for your product.